Every year, the Barker Plotkin family ascends from the Happy Valley to the windswept western hills of Heath, Massachusetts, to have a little busman’s holiday. Our day-trip to The Benson Place to rake up boxes of blueberries has become a cherished family tradition. In 2004, we made our first outing with baby Tim in the front pack. 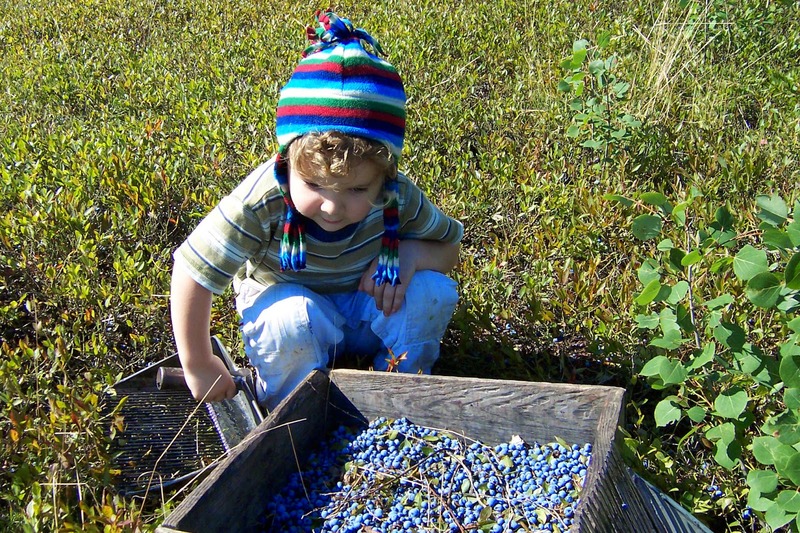 We read “Blueberries for Sal” to 2-year-old Jesse on our way, and he chided us throughout the day not to eat the sweet berries because we had to save them for winter. We didn’t listen, but still brought home 40 pounds of beautiful blueberries (and purple-stained teeth). We’ve made it up there nearly every year since. This year seems to be a banner season for berries. Like our bumper strawberry crop, the farmers at The Benson Place are enjoying a fantastic crop. Is it because we didn’t get a late freeze that damaged blossoms? Is it a particularly good year for pollinators? We’re not sure, but are grateful. Lowbush blueberries are a treat to harvest, too – rather than pick individual berries from bushes, special blueberry rakes can scoop up masses of berries all at once. Today, with excellent picking and our now-big boys helping, we raked up more than 60 pounds in less than an hour! The process of sorting them back at the barn actually took longer than the picking itself, but was full of camaraderie as people picking tend to help one another sort through their berries. We put most of the berries into quart-size freezer bags and stock up our chest freezer for the winter. I like to make a batch of jam, and a pie or two. The small berries freeze beautifully, and we make generous use of them all year in muffins, pancakes, and smoothies. It is New England beauties like these semi-wild blueberries that assuages envy of California foodshed delicacies like avocadoes and limes. Timmy showing how it’s done! Although it still is farm-related work to pick 60 pounds of blueberries on your day off, visiting another farm where we aren’t in charge is definitelya relaxing break! Farmer Jeremy did actually rake blueberries as a job. One summer during college, he and some friends raked blueberries in eastern Maine. They camped all summer on land owned by the man for whom The Grateful Dead wrote the song “Cosmic Charlie.” It sounds like a great summer gig for a young person, but now my back cringes at the thought of all that bending to rake the berries, followed by sleeping on a camp pad every night. We’re grateful to live in such a beautiful area with a thriving farm culture. If you’d like to give raking low-bush blueberries a try, the you-pick fields at The Benson Place will be open one more weekend. If we see you with purple teeth, we’ll know you went!